Do want to get your 4-6 year old involved in a program that will help prepare him for his upcoming school years? Would you like an activity that can help your child use up his or her youthful energy? 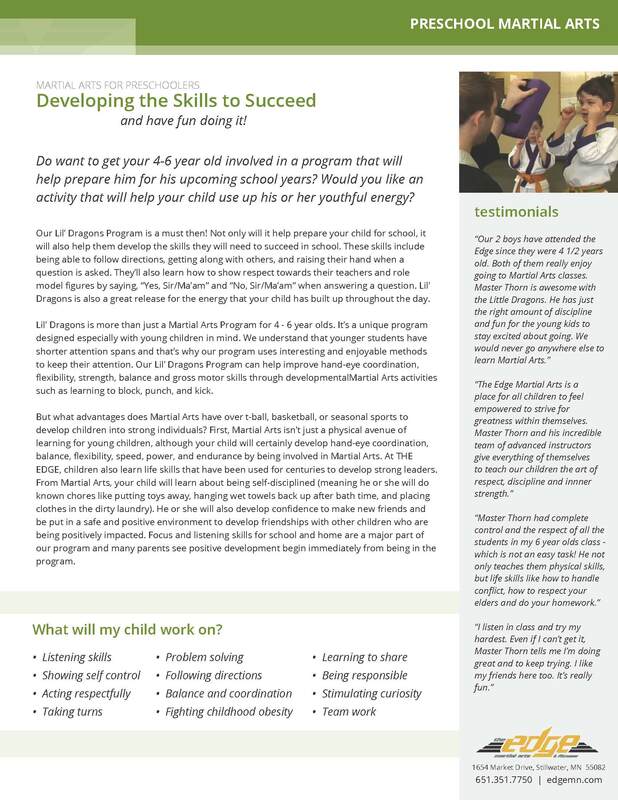 Our Lil’ Dragons program is a must, then! Not only will it help prepare your child for school, it will also help them develop the skills they will need to succeed in school. 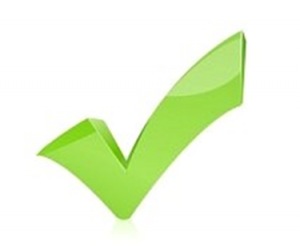 These skills include being able to follow directions, getting along with others, and raising their hand when a question is asked. They’ll also learn how to show respect toward their teachers and role model figures by saying, “Yes, Ma’am” and “No, Ma’am” when answering a question. Lil’ Dragons is also a great release for the energy that your child has built up throughout the day. What will my child work on? 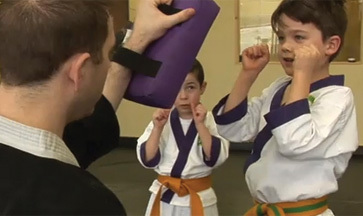 Lil’ Dragons is more than just a Martial Arts Program for 4 - 6 year olds. It’s a unique program designed especially with young children in mind. We understand that younger students have a shorter attention span and that’s why our program uses interesting and enjoyable methods to keep their attention. Our Lil’ Dragons Program can help improve hand-eye coordination, flexibility, strength, balance and gross motor skills through developmental Martial Arts activities such as learning to block, punch, kick, and tumble. But what advantages does Martial Arts have over t-ball, basketball, or seasonal sports to develop children into strong individuals? First, Martial Arts isn’t just a physical avenue of learning for young children, although your child will certainly develop hand-eye coordination, balance, flexibility, speed, power, and endurance by being involved in Martial Arts. At THE EDGE, children also learn life skills that have been used for centuries to develop strong leaders. From Martial Arts, your child will learn about being self-disciplined (meaning he or she will do known chores like putting toys away, hanging wet towels back up after bath time, and placing clothes in the dirty laundry). He or she will also develop confidence to make new friends and be put in a safe and positive environment to develop friendships with other children who are being positively impacted. Focus for school and listening skills for home are a major part of our program and many parents see positive development begin immediately from being in the program.